Consultant pharmacist Robyn Saunders has spent much of her career committed to improving the standard of aged care but that doesn’t mean the young have escaped her attention. Ms Saunders, who was awarded the Victorian Pharmacist Medal at the recent 2018 Victorian Pharmacists’ Dinner, has also personally mentored hundreds of ECPs as she strove to drive her industry’s professionalism and clinical expertise higher. The first 15 years of her career were spent as a hospital pharmacist, establishing the drug information centre at Heidelberg Repatriation Hospital. Her work at Heidelberg mainly centred on the care of returned veterans, an ageing population, which ignited her interest in the aged care demographic. ‘Because of the number of disease states they have, and therefore the number of medications they need, this increased the complexity of their care,’ she said. Ms Saunders later moved to the private hospital sector, implementing ward pharmacy services at Epworth Hospital. She eventually partnered with fellow pharmacist Jenny Gowan to establish MediCom Medication Services, which provides clinical services to residential care facilities and partners in medication education. Ms Saunders said Medicom strives to provide training for young pharmacists moving into residential care and medication education in order to encourage them in their careers and improve standards of care. ‘Our funding certainly depends on us being experts in medication management, and being clinicians rather than being associated with the suppliers of medications,’ she said. ‘It’s therefore paramount that we do have a high quality of knowledge about pharmacology and the ageing population. Ms Saunders also worked with software developers to create a cloud-based tool platform named QUMulus, which provides medication guides, clinical auditing tools and drug information for consultant pharmacists. Meanwhile, her work as a practitioner researcher has seen her involvement in pharmacy practice research projects in Quality Use of Medicines and medication management. 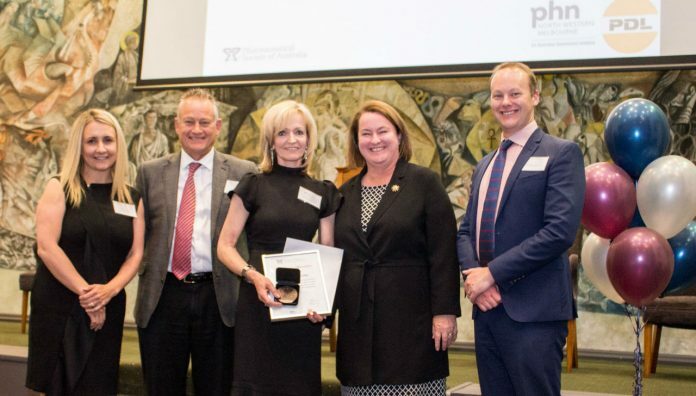 When presenting the medal to Ms Saunders, PSA Victorian President Benjamin Marchant said, ‘Robyn is a strong advocate for evidence-based practice and has personally mentored hundreds of pharmacists. Ms Saunders said she was humbled and delighted to have received the award. ‘I’m absolutely thrilled, especially when I look at the names that have been presented with this great honour in the past,’ she said. Also recognised at the dinner were pharmacists Angela Lawrence, Dimitra Tsucalas and Christine Bellamy for their significant contributions in rural hospital pharmacy, community pharmacy and primary healthcare network respectively. PSA past Victorian President David Newgreen received his Lifetime Service Award, marking his recent retirement from the Victorian Pharmacy Authority. PSA National President Dr Shane Jackson also joined Mr Marchant in recognising PSA Life Members Ann Howe, Tom Shen, Warren Ritchie, Russell McPhee, Joe Sztar and David Meller, as well as Student of the Year Rhiannon Froude from Monash University and RMIT Gold Medalist Sarah Hassan. Image caption: Janelle Devereus (NWMPHN), John Guy (PDL), Robyn Saunders, The Hon Mary Wooldridge (Shadow Health Minister) and Ben Marchant (PSA Victorian President).